It reminds me, in its seriousness and beauty, of ancient stone sculpture from the Iberian peninsula. Simply lovely. A bit sad, or solemn, or perhaps simply thoughtful. Actually, there is a hint of amusement at the bottom. St. Anton, I hadn’t seen the Iberian connection before but you’re right and I’m so happy to be even unconsciously part of that fantastic culture. Marja-Leena, takes a fellow printmaker to recognize the drypoint medium :) It’s one that I’m so fond of for its directness and the rich shadows it allows. zhoen, I don’t see amusement in this image but sadness, yes, certainly. very interesting work and I think that faint smile is the sad one which indicates an awareness of what cannot be changed and a wry acceptance of an unpleasant reality which cannot be changed. I’m interested in the process by which you visual types come to think of *this* piece as a submission for “short shorts” as opposed to *that* piece. Natalie, how big is the original drypoint? Do you have any prints for sale, if anyone should be interested? Pica, to be honest, we haven’t gotten many submissions of visual images this time, and so we are encouraging artists to respond to the texts. Interested artists who aren’t known to the editors should ask us to review their work on their websites, and if we think there might be a good fit, we’ll send a few upcoming texts for them to think about; they can then send some submission for further review. This piece of Natalie’s is one of several she sent; it seemed to work well following Fiona’s poem, and with the generally introspective tone of many of the pieces that have been published so far. Send us something! We’re also interested in stand-alone visual “short shorts”: images or brief image-series that have a self-contained short story for the viewer to see, or invent! Beth, yes there would be a couple of these drypoints for sale. The original image is 19 X 20 cm (about 7.5 X 8 inches). Thanks all. Pica, I was encouraged by Beth and Dave, the short-shorts editors, to send things that might fit with particular prose or poetry submissions without necessarily illustrating them. So I went through some of my large stock of work and pulled out a few images that could adapt to particular moods or subjects. I really welcome the challenge of this process and the opportunity to be “matched” with a piece of writing I thus discover for the first time. I hope there’ll be lots more chances to engage in this kind of spontaneous collaboration. 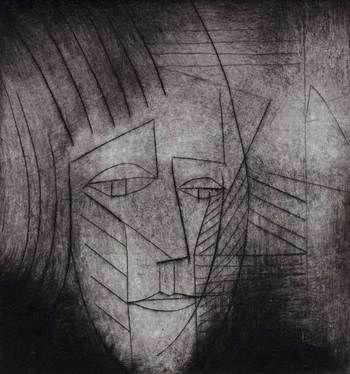 And hope you’ll pardon me if I take a moment to free-associate this: struck me immediately as a wistful art-love-child of Paul Klee and Kathe Kollwitz. I come back and forth to this one. with so few lines you’ve captured so much of what it is to be human. it alternately reminds me of a religious sculpture and a passing face glimpsed behind glass. it seems inspired rather than concocted. i’m guessing the final look surprised you too. Lori, I can see what you mean but while I much appreciate those two K’s, I don’t think they have been significant influences on me. But I’m so pleased when other eyes than mine see things in my work that I wasn’t aware of. Mikey, you’re quite right, I was surprised by the end result. The drypoint medium demands a very spontaneous approach and I drew this very quickly. The great thing with printmaking is that you never quite know what your final image will be like until you’ve inked, wiped and printed it and the surprise element is the joy of it.